Wood Lane Timber Merchants have bought a 1.5 acre plot of land on Wigwam Lane and work on the new build began on Monday this week. The firm, founded by Pat Kelly in 2003, was doing well until the recession of 2008 which badly affected all areas of the economy and hit the building trade hard. Pat said: “Our turnover dropped by 60 per cent virtually overnight. We lost four of our top ten customers in the first six months – they went bust. It was tough. The firm is investing £750,000 in the new site on Butlers Hill Industrial Estate, where it will increase the range of products and services it can offer. “It’s an exciting time,” said Pat, 50, who expects the expansion plan will create four or five extra jobs. Born and bred in Hucknall, he was educated at Holy Cross Primary School in the town and at Christ the King in Arnold. He has lived in Farnsfield for the last eight years. He founded the firm himself, after working for over 18 years for his dad who ran Whittaker & Co Builders Merchants in Kirkby and Hucknall, followed by work for a joinery contractor in Edwinstowe. He currently employs eight people. 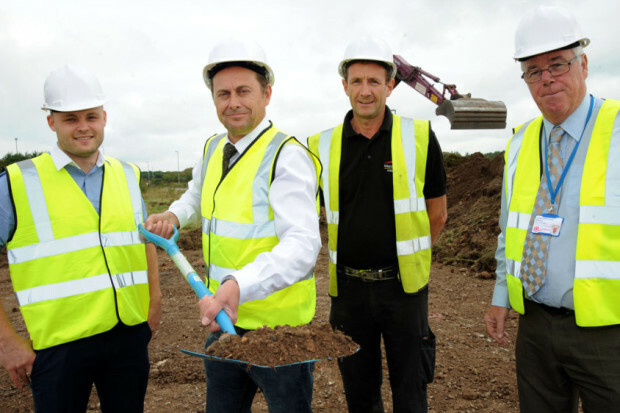 Councillors Mick Murphy and Ben Bradley, with Vaughandale Construction’s Alan Connor joined him for a sod-cutting ceremony on to mark the start of work on the new location. Next story Christopher Sills. NCHA Maintenance Dept.